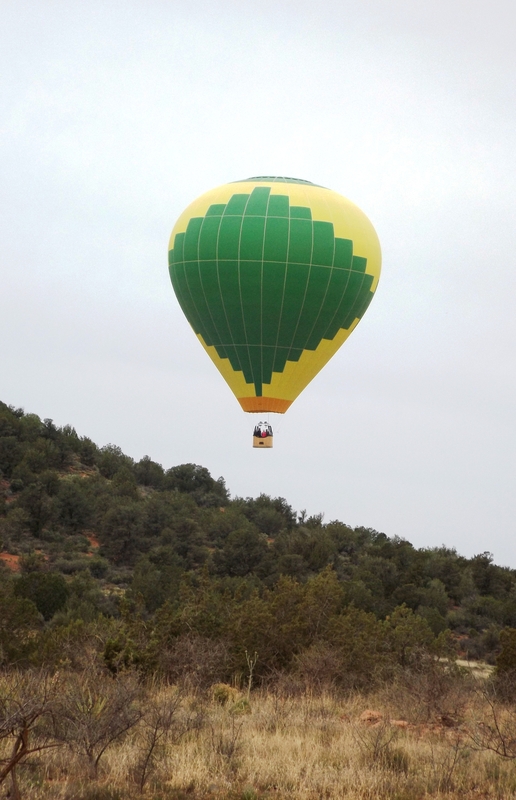 Long before 7:00 a.m. in our Sedona boondock site we awakened to this sound: “Fwooosh … Fwoooooosh!” That’s the unmistakable call of a hot air balloon’s burners, very close. 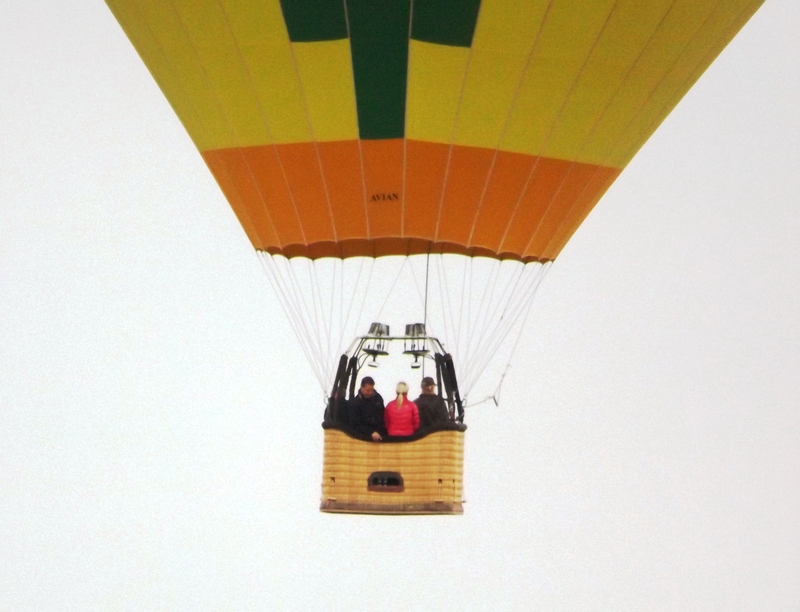 And there it was, no more than a quarter of a mile away, struggling to gain altitude. Balloons go up very early around here because they’re more buoyant in cooler air, not to mention that the mild morning breeze is unlikely to blow them somewhere their chase vehicle cannot go. And that’s how our big day of touring Sedona began. That, plus blueberry pancakes with apple wood bacon. 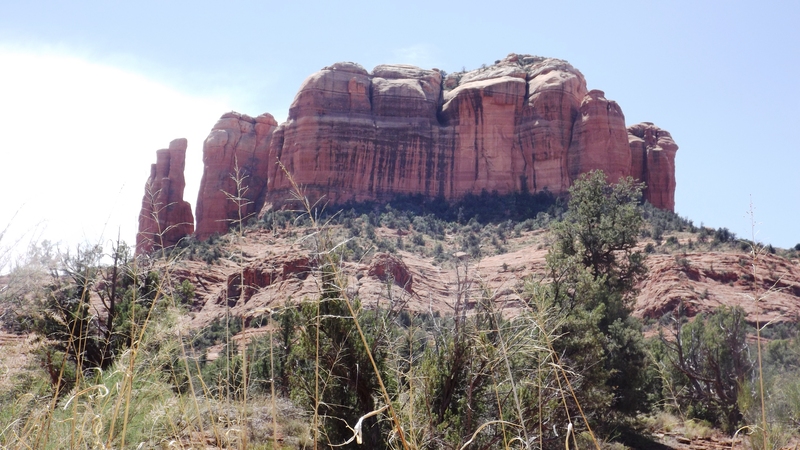 We had previously driven Sedona’s Red Rock Loop, a 12 mile circle of sandstone beauty, with some insane overlooks and lots of fine homes nestled into the walls of these ancient cliffs and buttes. All but half a mile of it is paved, so that’s a very nice little Sunday ride, even if you take it on a Thursday. Today we planned to visit The Chapel of the Holy Cross built 50 years ago atop a pair of sandstone peaks some 200 feet above the high ground below. 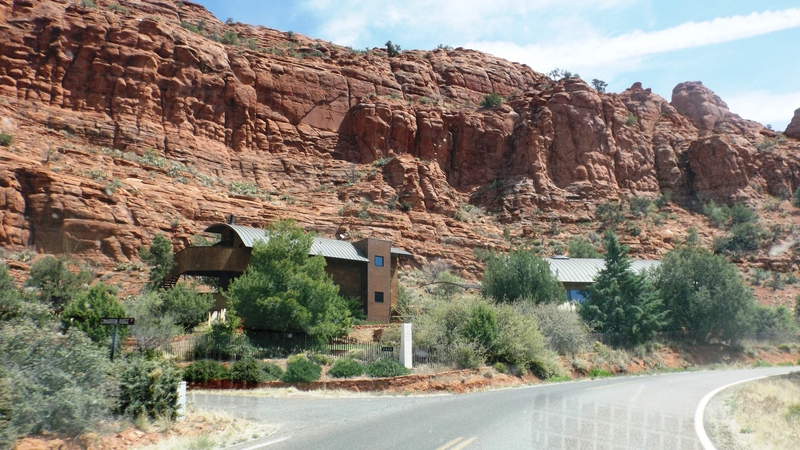 After that we would drive around Back O’Beyond Blvd, see the gates of some painfully expensive homes, and maybe get a picture or two of Cathedral Rock (the one without a chapel). The Cathedral Rock pics did not come out so well, but the second string photographer was beyond the shutter while the first teamer drove the truck. The Chapel of the Holy Cross began as a Catholic church, but its parish soon grew too large. It is now non-denominational six days a week, with a special Catholic service on Mondays. We learned that urban legends notwithstanding, neither Frank Lloyd Wright nor his son Lloyd designed it; that was the work of Aschen + Allen of San Francisco. The chapel was envisioned and funded by Marguerite Brunswig Staude, born in New Orleans, a sculptor educated in France who later became heiress to a wholesale pharmacy fortune. (Papa Brunswig did a huge patent medicine business, inventing most of them himself.) 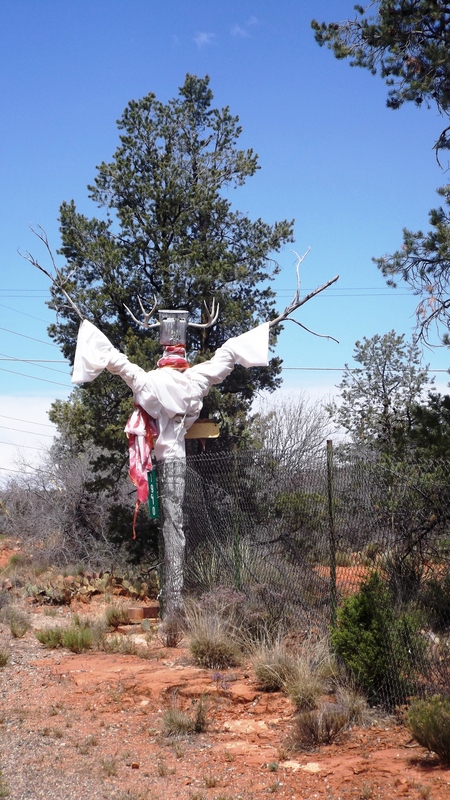 She sold the project to the junior Senator from Arizona, Barry Goldwater, who persuaded the Secretary of the Interior to sell a few hundred acres of Forest Service land for the Chapel. 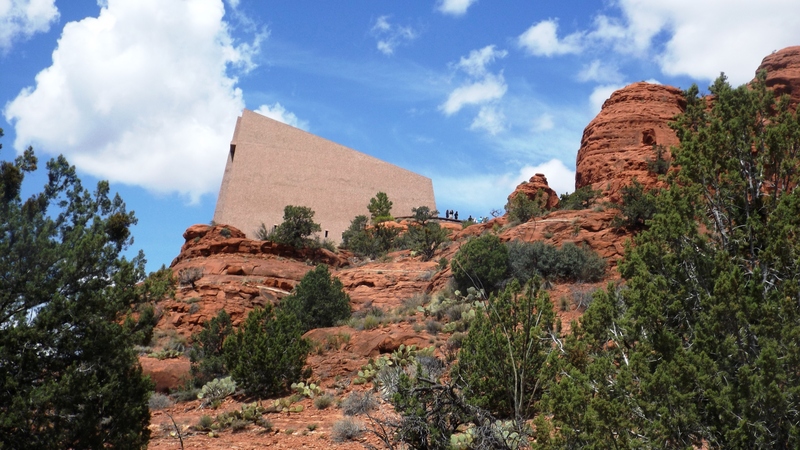 There had been many previous plans for the Chapel set in many different cities and nations, but Sedona won out. 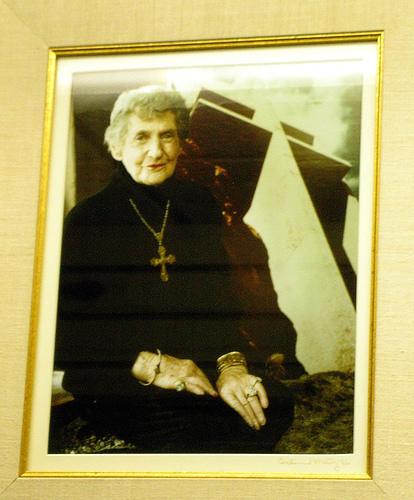 Mrs. Marguerite, a devout Catholic, hoped to build a monument dedicated to finding God through art. Upon its completion, she considered The Chapel to be her greatest artistic achievement, and the fulfillment of her life’s mission. And yes, she nailed it.